5. 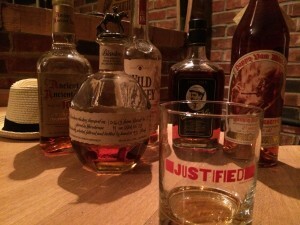 Raylan brings Art a bottle of get-well Blanton’s. 4. Ava has Wild Turkey 101 for breakfast. 3. Raylan uses Ancient Age to burn the contents of Arlo’s foot locker (and, symbolically, Raylan’s hated past). 1. Boyd breaks open the bottle of Pappy 20-Year-Old stashed in his folks’ cabin just before Ava reveals she’s a snitch. And yes, that is Elmer T. in the glass in the photo. I’ll be pouring another shot (or two) tonight.